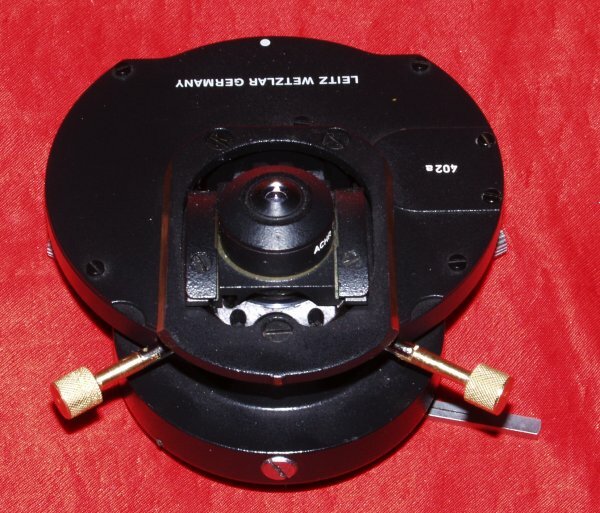 Recently while browsing Leitz microscope equipment on the eBay auction web site, I noticed a pair of the special phase condenser tools that are used to adjust the phase annuli on certain Leitz phase condensers. What struck me was the incredible high price! Furthermore the auction still had several days to go! There had already been about ten bids. I am sure that when the many sniper bidders entered the auction in the last 15 seconds before it closed, the price must have become astronomical! The Leitz phase condensers which were bringing such dramatic bidding for their adjustment tools actually require two such special tools, both of which need to be attached to the condenser at the same time to adjust it. The image to the left of this text shows such a condenser with tools attached to it, ones that I fabricated, and that will be described in this text. The peculiar size and shape of these tools make it almost impossible to locate any replacements not specifically designed for this application. These tools are basically 1.5mm square nut drivers. Square nut drivers are difficult to obtain in any size, let alone in this tiny size! To make matters worse, the diameter of the shaft must be 3.6mm or less, or it will not fit into the well where the adjustment screw is located. The original tool was articulated to enable it reach around the mechanical stage controls. It makes sense to make the replacement tool shorter so that it does not have to do this. The tool however, must not be too short, or it will not be able to reach the head of the adjustment screw. The original tools are small and tend to become lost. The bidding on the eBay auction demonstrates that replacements are extraordinarily expensive—especially when one realises that similar tools with hex or Allen heads cost practically nothing! I suspect that one could have bought a substantial used microscope for the usual sales price for these! It seemed to me that it was ridiculous to purchase anything so dramatically overpriced!! I thought about this problem a long time. I first attempted to find 1.5mm Robertson (square recessed) head screws. I thought I could turn them down to 3.6 mm and attach them to handles. However, I was never able to find Robertson head screws this small! After failing to find 1.5mm Robertson screws, I tried a new approach. This was to fabricate all brass nut drivers with 1.5mm square holes on the end of a 3.6mm diameter shafts. The principle problem is that drill bits do not drill square holes! I ground a piece of hardened steel to make a 1.5mm square broach that I pressed into a 1.5mm circular holes drilled in brass stock. This makes acceptable tools, but after I made the first one of these, I thought a much better solution to the problem. While I was winding my grandfather clock one Saturday morning the idea suddenly came to me! Clocks and watches that require keys to wind them always use square drives!! I quickly learned that 1.5mm is an extremely common size for watch keys. (Jewellers call it a #5). I discovered that they are amazingly inexpensive, so I purchased three of them. (I suspect one could purchase at least 100 of these for the going price for one Leitz adjusting tool!) The ones I obtained are made of steel with a brass "wing" for the handle. The steel parts are 3.5mm in diameter—the perfect diameter for this application! The brass wing handles fit into 1.25mm wide slots in the steel bodies of the winders. They are held in place with 1.0mm press fit brass pins. 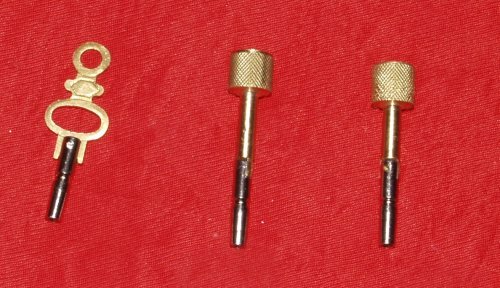 The picture above shows one of these keys in their original form, and two that have been modified to make "Leitz compatible" nut drivers. These watch winders can can only be used to adjust the phase rings by trial and error, since their original handles are too large to turn with the condenser in place on the microscope. It takes a seriously long trial and error process to do complete the adjustments this way! The original handles must be discarded and replaced. 1. Remove the tiny 1.0mm brass pins that hold the brass handles in place on the keys. Each key has just one pin, and it only goes through one side of the steel part of the key. Thus the keys cannot be pressed out. The only feasible way to remove these pins is by drilling them out with a 1mm drill bit! (Do not even think of trying to do this with a hand drill!) The handles will just fall off after the pins are removed. 2. Make the tool handle. It is fairly easy to do this with a small lathe. The best material to use for this is brass, as 360 brass is MUCH easier to machine than about any other material. It is best to use brass rod stock about 10mm in diameter. The handles needs to be between about 25 and 30mm in length, this length is not particularly critical, though it is certainly possible to make them either too long or too short. About 8mm can be knurled, and the rest needs to be turned down to 3.5mm diameter. It is easier to put a longer piece of brass in the lathe, and cut off the parts after they have been made. 3. Mill the 3.5 diameter end of the tool handles so that they will fit into the slots of the watch key parts. The width of these slots is 1.25mm. It is best to mill both sides of the parts without ever removing them from the milling machine, because it is extremely difficult to get these tiny parts remounted square!!! 4. Attach the handles to the steel watch key parts. The simplest approach is to attach them with epoxy cement. This material is quite strong, and seems to be adequate. I deliberately made the one for the left side of the condenser slightly longer than the one for the right because the one on the right is easier to insert behind the mechanical stage adjusting knobs if a bit shorter. The two new tools made in this manner work perfectly. The Leitz condensers are made with extraordinary care, so they adjust easily with no backlash. In most respects adjusting tools made in this way are actually superior to the ones originally supplied by Leitz. I have used phase adjusting tools made by the above procedure for some time now. I was concerned that the epoxy cement would be inadequate to hold the new handle to the key. This concern seems to have been not valid. It would be easy to attach them more firmly: A 1mm drill bit could be used to drill into the brass handle through the small holes that that held the original handle in place. A 1mm pin could then be pressed into place. Many paper clips are made of 1.0 mm stock, they could certainly be used to make tiny pins to hold the handles on more securely. One could also produce a tool like this without a lathe and milling machine. A person with extremely steady hands and very sharp eyes should be able to take a 3.5 mm brass rod and use a high speed grinding tool to make the 1.2mm wide tab on one end that is needed to attach it to the steel watch key winder part. One could also take a nail or 3mm Allen screw of proper length and cut and grind the one end the same way. When I machine replacement parts for microscopes I always attempt to produce them to the best design. Often that involves simply duplicating the original. However, in many cases it is obvious that the original design was inferior. It was apparent to me that these tools were such an example. It would have been a very simple task to duplicate the articulation of the original tools but doing so would have produced an inferior tool. It makes a lot more sense to make them short enough so that they do not need to be articulated—they are simply a lot easier to use that way. After using the tools fabricated in this manner it was apparent that they were a LOT better than the articulated ones that Leitz supplied. 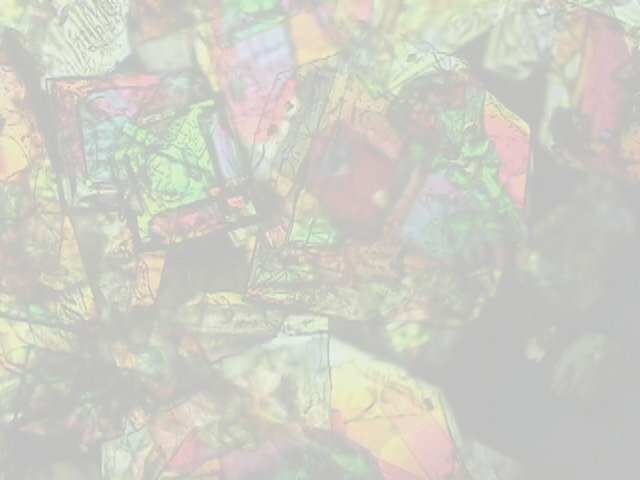 It is odd that Leitz did not provide some sort of storage location on the microscopes to place things like this to prevent their getting lost. All comments to the author Robert Pavlis are welcomed. Published in the March 2006 edition of Micscape Magazine.